Static posture of first form in Positive Circle. Horse stance – about 2 shoulder wide, rear foot point straight to the front. Front foot pointing 45 degree out and front foot heel is on the horizontal line of the rear foot toes. Rear hand rests on waist. Keep both kuas open, front hand stretches out with elbow vertical line not exceeding the top of thigh. Elbows always kept inside between thighs. Only hands can reach outside. Head leans to back shoulder a bit to counter act the intent. Palms can never face the sky, front palm faces 45 degree to the front downwards. Keep the elbow of front hand holding in the same position and stretch the wrist with fingers pointing to the opponent. Master Chen adjusted our hands and shoulders so that the front hand pointing out and it aligned with the rear foot in a straight line. The joints get tensions, from front hand fingers to wrist, front shoulder, front waist and kua then through the back and then rear shoulder, rear waist, rear kua and then rear knee and finally rear foot. I feel my front hand fingers a bit numb when the power compress the hand. Horse stance about 1.5 shoulder wide, start with left side. Both hands start at the left waist. Left hand stretch down to the right side of the left knee with palm facing front. Left shoulder sinks down. The left kua opens. Right hand with palm facing the belly and elbow rolls horizontally along the waist to the back. The torso does not go down or bend down with the movement. Take note of the right side of the dantian that turns up while the left hand stretching down. Master Chen demonstrated that you can also use both Fetching Water action (left and right waist splits) at the same time in push hands to neutralize the opponent’s force. He mentioned that we could develop all 18 joints/splits moving independently in action. I think this turning dantian is the main gear of the body machine. Horse stance about 1.5 shoulder wide. Front hand pushing away from the belly button with palm facing almost up and rear hand pull back and rotate down. The knee at the same side of the front hand turn down a bit to rotate the torso. Keep torso straight and rotate with the hand push/pull movement. Spine rotates but without up and down movement. Hands take turns to reach out along an axis pointing perpendicular to the torso so the hands like sliding along a pole. Take note that the elbow of the front hand pushing needs to lean toward the invisible pole. I have asked questions about what is “Open” and “Close”in Taiji. He pointed at one student with short straight hair said his hair is “Open” to compare with my hair which coils is “Close”. I figured out “Close” does not mean collapsing inward. “Close” is as “Elbow in” in positive circle, “Open” is “Hand out”. “Peng” energy is always on no off. A. Double An – Master Chen demonstrated the Double An (press) Hands on me. He moved one step with very small hand movement pressing on my belly and I were issued upwards and landed about 5-6 feet back. Later, he told us although his hand movement is small but his waist and horse stance had moved a lot to issue the power. B. Hammering Fist – Fist swing down like whip impact is very strong on my chest. C. Palm side chop – impact of palm strike felt clear with no deviation. F. Punch - He punched at my belly with short distance about 20cm. I felt energy penetrating into my belly. Swing the hand as whip and suddenly stop at the elbow and the hand carry the momentum to strike. When you issue power, the “no move” body parts get to be still as rock, the moving body parts get to move without any deviation. A. Push Hands with Nicholas – I pressed Nicholas to bend backward as low as possible. When he almost lost his balance, he turned joints and put me off balance. Second time, I pushed him in a horizontal circular movement and he leaned his shoulder directly towards my chest and squeezed me off balance. B. Push Hands with Michael – he showed me a technique to issue power like vibration of guitar string. He stretched out his hand pointing far away from my back over my other shoulder then both arms stretched and rotate his torso and bounced me off balance. C. When I pushed Master Chen, he slightly pressed on me and both our body structures connected became one and I could not issue any power on him. This is called “Linking”. D. ”Sticky” – it is like putting nose fluid on your opponent’s hand, no matter how he flips his hand, he cannot get rid of it. Master Chen pushed hands with me to demonstrate “Sticky”. Several times it looked like he was very close to be off balance and still I could not get him off . E. When I started to press Master Chen, he turned, pulled me off balance. I was issued backward along a straight line over ten feet and fell down. He called this “Long power”. A. One held the rubber cord, I held the rubber cord and pulled away from him as count 2 in Negative circle. I felt the tension on my front waist toward my rear kua. We then did another exercise “In with elbow, no hand” . My hand was pulled by another student, I point my fingers to him, sink down the elbow as count 2 in negative circle and turned the waist and this rotated him side way. B. One held the rubber cord, the rubber cord was around my waist. I walked away from him until the rubber cord pulled me back to the “Double Heavy” state. It is so tight that I bended backward and could not keep my balance anymore. At that moment, I turned one knee up and got back the balance. B. Rhythm- You say “Hum” to start the assault and expect your opponent’s nose to breath out “Ha” when you complete your action. I depict it as the action needs to be completed in one breath. C. Space – When you intercept, you “close” with your opponent to fill up all his negative space. Whenever you can close with him, you issue him out at once. If he starts to move after you close him, he will be off balance and issued out. D. Center – Keep center no movement. He demonstrated application of “Flash the Back” in Yilu as an example. Whenever he moved, there was a spot at the middle of his chest that did not move with his action. Master Chen emphasized “Yin Yang Separation” is the most important principle in Taijiquan. Always keeps in mind to have two spots moving on the same line but opposite directions in the movement of Yilu while other body parts stay still. I have not attended any Practical Method workshop before. I could not expect Master Chen would teach all these in one day and my eyes opened. 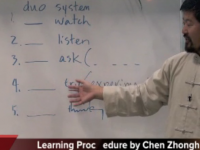 Master Chen’s teaching style is very open and students can have hand on experience with him. This is very important to learn Taijiquan as most actions are working inside the body. He can explain profound Taiji principles and theories with understandable terms using daily examples. For me, Practical Method is a “Form follows Function” style Taijiquan. It is so minimal that there are no fancy movements. As foundation exercises, forms and applications are all closely related in one set, that makes it very effective to learn. Master Chen, thank you very much for your teaching. I hope one day I can go to DQS to join the full time training.